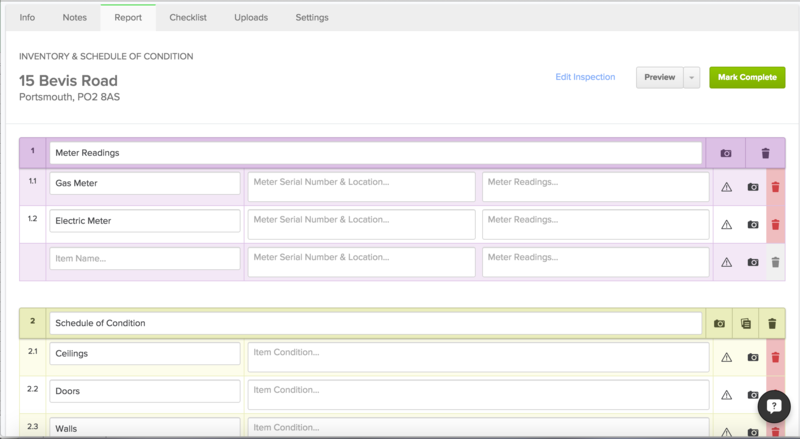 If you are continuing with a report that you have completed on the mobile/tablet App, make sure you have Synced all your changes online (check that your Inspection has disappeared from your Inspections List). If you’ve already started it from the App, you’ll be able to jump straight into the report by clicking on the Report tab along the top. Otherwise click Start Report to activate the report for editing. Once you’ve activated the report, the status will change to ACTIVE, and you’ll see the new tabs and buttons appear along the top. Note: You may see Accept / Decline buttons prior to seeing the Start Report button if turned on. Notes – where you will enter the preceding notes to come after your report Disclaimers. Report – Where you will enter the rooms, items and conditions of the report. Uploads – Where you will find and add all photos and files associated with this report. 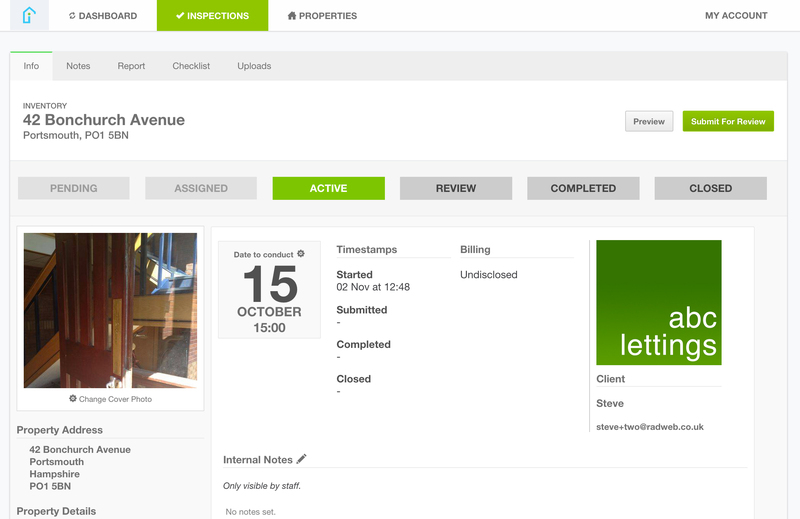 Preview – to see how your report looks as you continue to add details to it. Mark Complete – once you’ve finished entering the report, mark it complete. If you’ve completed and Sync'd the report already from your App, you will see all the information here. You or a colleague also may have loaded this Inspection with a Template, so you’d see a list of pre-entered rooms and items to fill in conditions for. You can also work from a blank template, using the keyboard to tab through fields and type as you go. You can input report details entirely from your keyboard. As you type, room names, items, descriptions and conditions will be suggested to you. Press down on your keyboard to cycle through suggested terms, then Enter or Tab to select them (or use a mouse). To re-arrange rooms or items within a report, hover your mouse over the numbering to the left, press and hold your mouse while dragging up or down to the position you want it in. When you drag rooms around, all other rooms will collapse smaller to make it easier to drag. 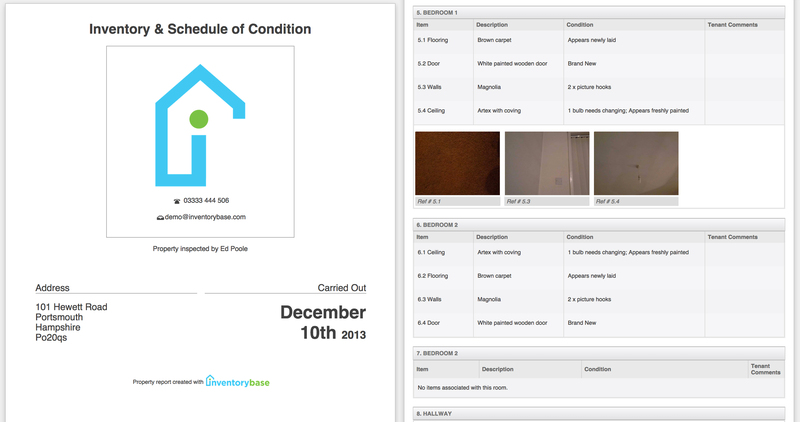 or Click on the Camera icon on the Item/Condition to drop down the list of assigned photos. Click on the Upload Images button to assign multiple photos to that item at once. 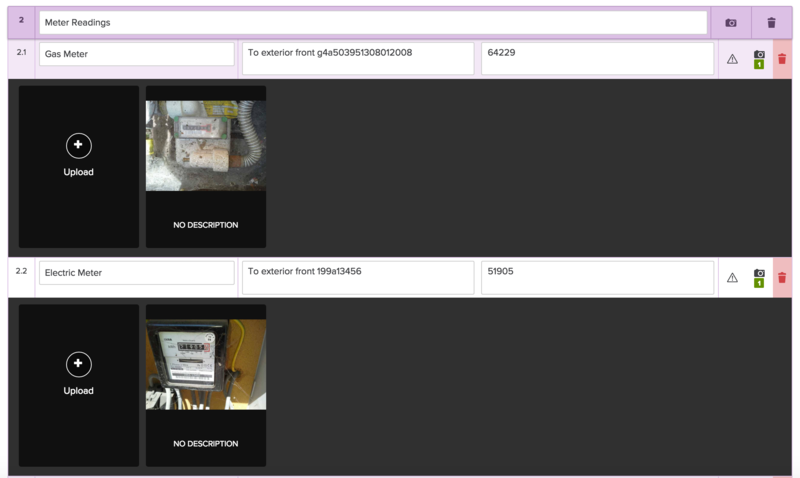 These photos will appear in the report with Ref X.X (or 1.1 in the above example) underneath instead of a description to reference the written condition. You can also upload photos in bulk on the Uploads tab. Select Choose Files to highlight all the images from your computer and watch as InventoryBase uploads all your images in the background while you continue to work. You can click on a photo to access options including room/item assignment, photo caption/description and marking as the cover photo. 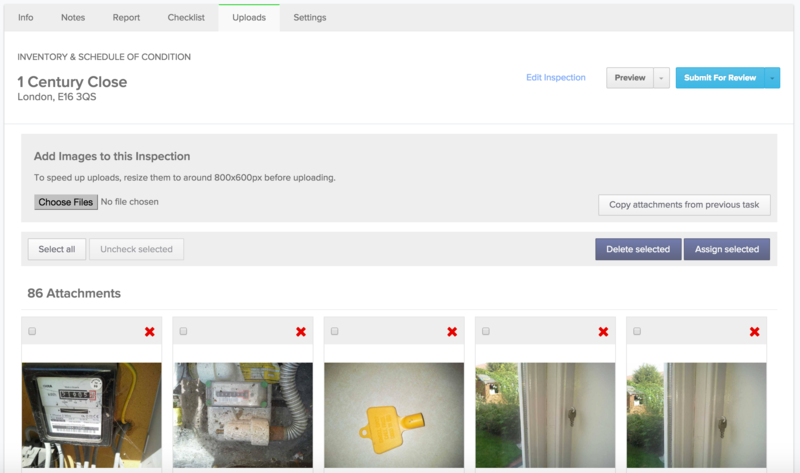 Alternatively you can assign (or delete) photos in bulk to/from specific rooms or items by ticking the checkbox in the upper left corner of each photo and clicking Assign selected. A popup will appear to choose the room/item. To select a range of photos, tick the first photo's checkbox then hold SHIFT on your keyboard and tick the last photo in the range. This will check all photos between/up to the final photo. If you want to attach a Notes page to the property, click Insert Default Notes or type whatever information you require free text. These Notes will precede the rooms, items and conditions pages. You can also see any internal notes here that will not be visible to the client. 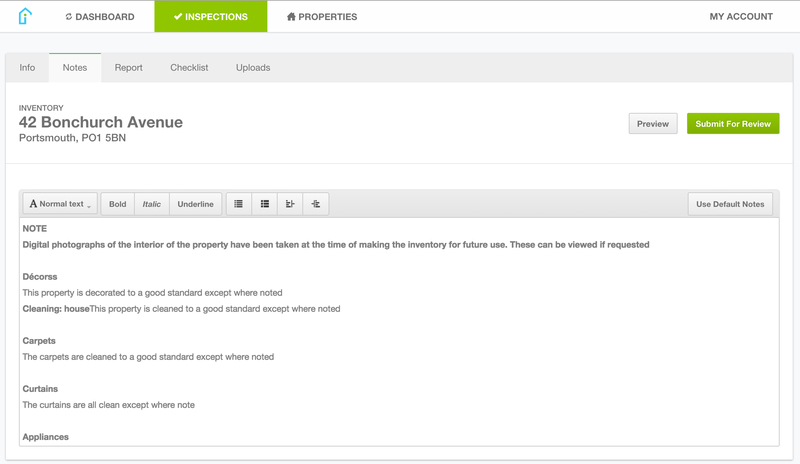 The next time you start a new report for this property, all rooms, items and conditions from this report will be copied through to update or amend as necessary, making Check Ins, Check Outs and Interim Inspections faster and more efficient. You'll also be able to view the photos taken for each room or item under 'Previous Photos' to use as reference points for taking new photos.